This Mobile Computer Stand has (4) Casters! This Display has Two Locking Wheels to Remain Stationary When Necessary! Display is height adjustable and ranges between 36" - 55"! 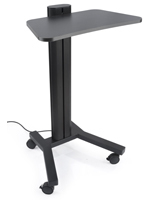 Black matte steel base is durable and matches any environment. Tilting surface allows most ergonomic angle. Locking casters to remain stationary. This mobile computer stand is ideal for trade shows. 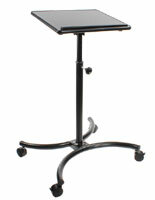 This height adjustable display can be utilized as a work desk or a lectern for presentations. With such versatility, this height adjustable mobile computer stand is ideal for trade shows. This display features (4) caster wheels, two of which are locking, so this unit is easy to move when necessary. 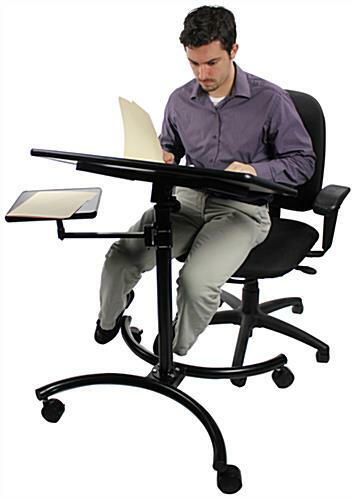 Each mobile computer stand that has two locking casters can also be kept stationary. These laptop desk carts also have an adjustable tilting surface. 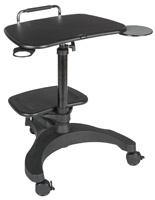 Set the angle of this mobile computer stand that has a matte black finish for ideal comfort. This display allows users to change the tilt surface. 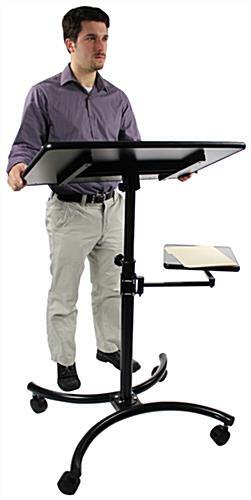 This mobile computer stand that has a 20.5" adjustable arm shelf allows users to place necessary items for work or presentations below the working surface. The adjustable arm can be spun and moved to a wide range of locations with an elbow joint and a rotating axel. Each laptop desk, mobile computer stand has a lip on the bottom to prevent objects from sliding off. The large work space is beneficial for users. 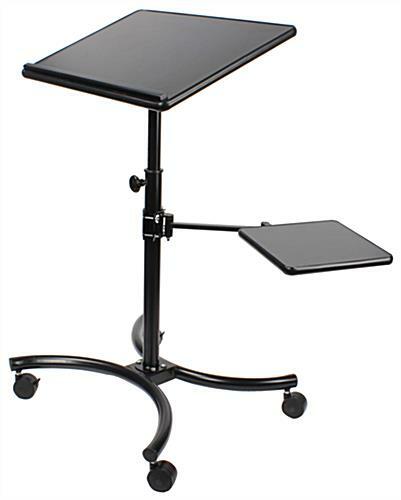 This 28" x 18" mobile computer stand provides space for both a laptop and any notes or accessories. This laptop display has as much space and mobility as many AV carts, but can also be used as a desk. 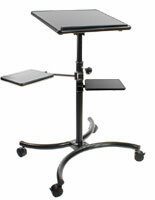 This mobile computer stand is a great addition to any trade show setup, business, or residential setting.